Study for Homage to the square: "Apparition"
Sidney Janis Gallery, New York (11535). Joseph H. Hirshhorn, New York. Hirshhorn Museum and Sculpture Garden sale, Christie's New York, 8 November 1989, lot 278 (incorrectly illustrated as lot 290). Acquired from the above by the present owner. 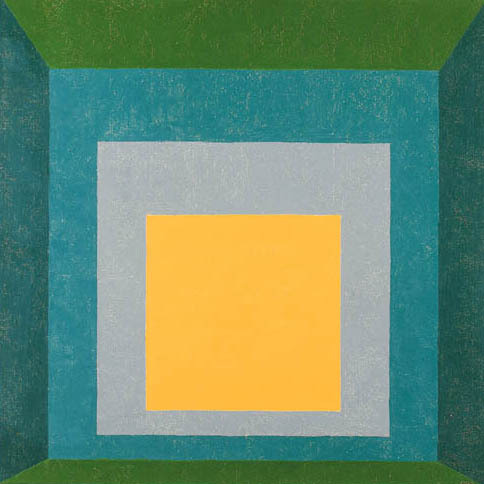 Caracas, Galleria Mendoza, Josef Albers: Homage to the Square, March 1964. Organised by the International Council, Museum of Modern Art of New York, this exhibition later travelled between April 1964 and January 1967 to Montevideo, Buenos Aires, Lima, São Paulo, Guayaquil, Quito, Bogota, Santiago, Mexico City, Knoxville, West Virginia, New York, Atlanta, San Antonio, Chattanooga, Minneapolis, Wisconsin, Richmond, Wichita. Philadelphia, The Makler Gallery, Josef Albers, March 1969. To be included in the forthcoming Albers catalogue raisonné being prepared by the Josef and Anni Albers Foundation. This work is a study for Homage to the Square: Apparition of 1959 which is in the collection of the Solomon R. Guggenheim Museum, New York.